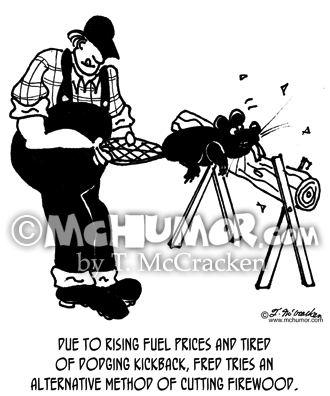 Energy Cartoon 8605: "Fred deciding which sort of power to use to cut wood for his wood burning air conditioner." 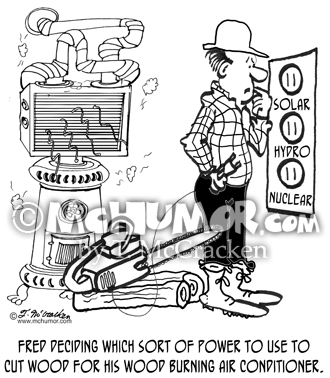 In front of a wood stove a man with an electric chainsaw looks at electric sockets on the wall that say "Solar," "Hydro Electric" and "Nuclear." 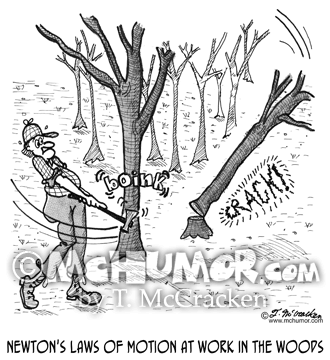 Physics Cartoon 2011: "Newton's Laws of Motion at work in the woods." 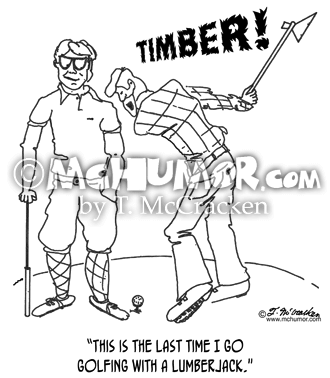 A logger whacks one tree that doesn't budge, but a nearby tree falls over. 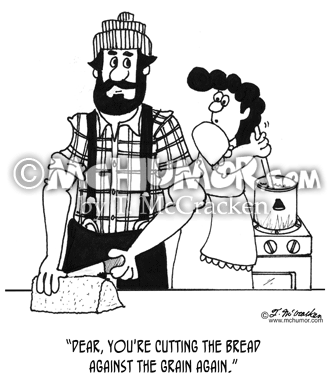 Logger Cartoon 3688: A woman says to a lumber jack cutting a loaf lengthwise, "Dear, you're cutting the bread against the grain again." 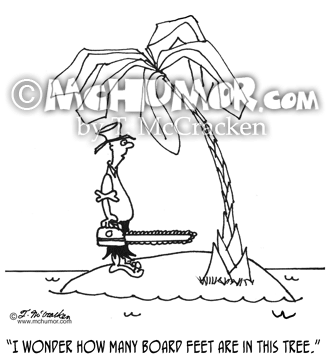 Logging Cartoon 3702: "Oh ho! 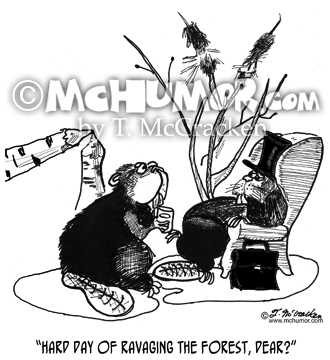 One log moved. 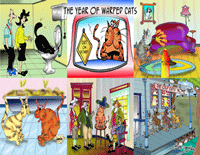 My turn, my turn." 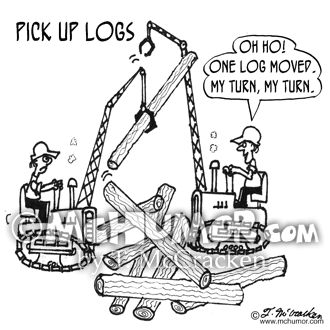 Loggers use giant cranes to play "Pick Up Logs." 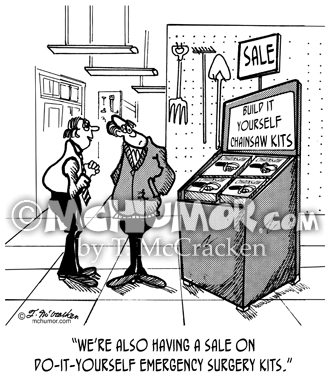 Chainsaw Cartoon 2143: A clerk at a hardware store says to a man looking at "Built it yourself chainsaw kits," "... and we’re also having a sale on do-it-yourself emergency surgery kits." 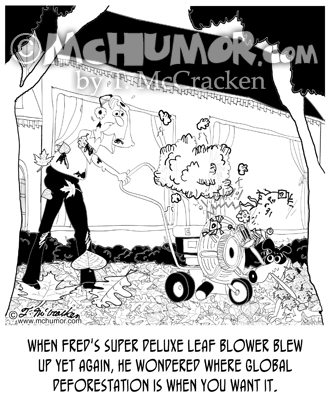 Leaves Cartoon 8827: "When Fred's super deluxe leaf blower blew up yet again, he wondered where global deforestation is when you want it."